Rogue Valley Messenger: Where does one start when talking about Southern Oregon Jobs With Justice? The organization works on many fronts. How about, what is the biggest threat right now to job security for many of the people you work with? Jason Houk: We organize our marginalized communities, labor unions, religious congregations, student groups and community organizations to improve working peoples’ standard of living, job security and our right to organize. SOJwJ has been in the community for over 10 years, working on issues such as living wage jobs, fair trade, health care and immigrant rights. Our organizers believe that we are all stronger when we stand together. 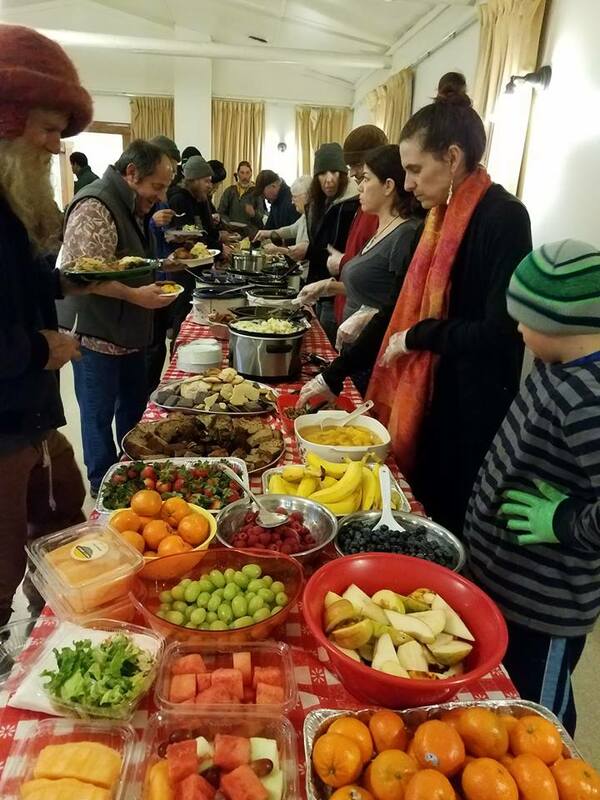 Rogue Valley Messenger: The meals that you help support provide both a great service, and also provide insight into who in our communities need help. What observations are you making about who needs support. Old? Young? Out-of-work or under-employed? Vanessa Houk: For several months I regularly attended the municipal court in Ashland, because I wanted to get a sense of what was happening in town. One Tuesday morning a young woman had entered the courtroom and after the judge called her name, she approached the bench. She was being charged with theft. I remember she stood there and apologized for her actions. ‘I know what I did was wrong, but my kids and I were hungry.’ Something broke inside me that day and every community meal gets me a tiny bit closer to fixing it. RVM: The work you do helps support many individuals on a daily basis. But how do you get past the daily work; meaning, how do you help someone break out of these cycles so that they are self-sufficient? That is obviously a big question, but what programs does SOJWJ provide towards that end? JH: For more than three years, Southern Oregon Jobs with Justice has been providing structure for community meals in Ashland. This grew out of seeing the need for hunger relief in our community and we’re currently organizing and providing meals five nights a week which ensures that there’s something to eat for anyone in need every day of the week in Ashland. We also provide a drop-off location at our office for donations that go directly to our most vulnerable communities. Our giving table is often stocked with basic necessities including clothing, blankets, feminine hygiene products, and other basic gear. We serve babies to seniors and everyone in between. A large percentage of guests are un-housed. We have many retired seniors who are living on small social security benefits and the meals and supplemental food we’re able to distribute to them keeps them healthy. What that looks like in real life is the face of a sweet 86 year old man who served in the military during the Korean war. He found us after his wife died and he was left alone, without any family. The community that is built at the peace meals becomes family. ‘You’re all my family now,’ he says. On a quiet night we serve about 30 people and numbers increase to more than 100 on Fridays during the summer months. We call what we do ‘love in action,’ because it takes dozens of volunteers and thousands of volunteer hours to do it. Many of the people who regularly visit the community meals are employed in some way and it’s often a challenge to meet basic needs (shelter, food, transportation and clothing). With housing costs continuing to increase in the valley, SOJwJ attempts to fill some of those gaps in a way that is accessible to all. RVM: Are there programs that local city councils are supporting which you see as positive examples about how local government can help? JH: SOJwJ is steadily working on creating a community kitchen which will be a place where unemployed workers can develop skills needed to work in local restaurants. We recently opened a warehouse office space at 330 East Hersey St. #9 for donations and outreach There we are working with volunteers and folks in the homeless community to assist and develop new programs. Much of our support comes from grants, private and in-kind donations. Donations of clothing, food or other goods can be brought to our office on East Hersey Street.